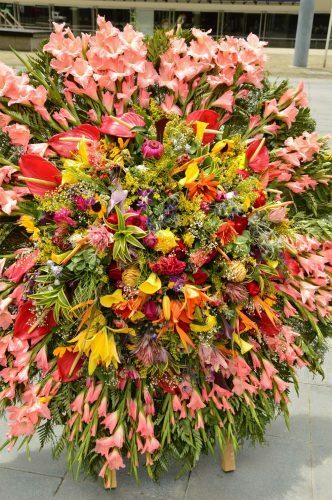 Did you know that Colombia is one of the biggest producers of flowers in the world? 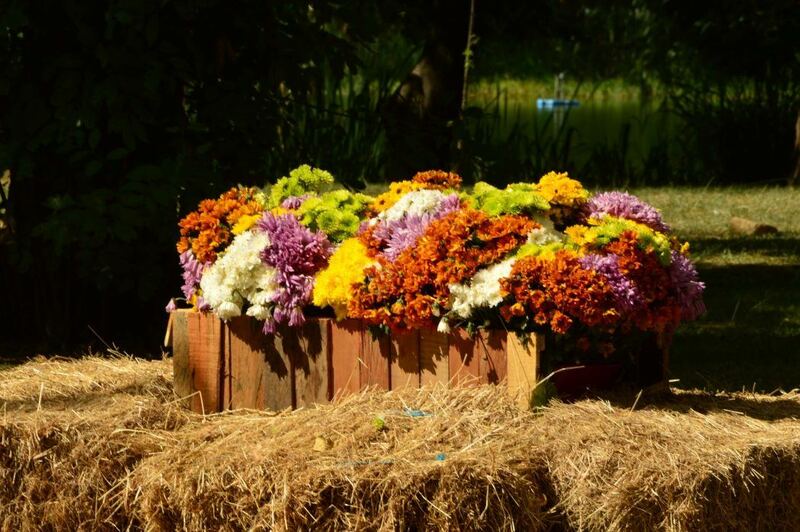 They supply more than 60% of the flowers sold in the US. 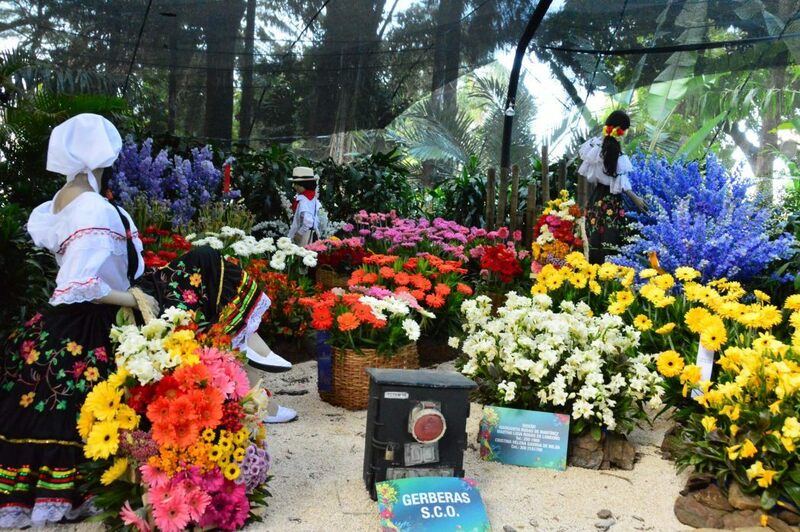 The prime source of these flowers is the area around Medellin – a benefit that comes with a climate that has given Medellin the nickname of the City of Eternal Spring. So it should come as no surprise that the biggest week of the year is the Feria de las Flores Medellin. For my complete Guide on What to Do in Medellin click here. 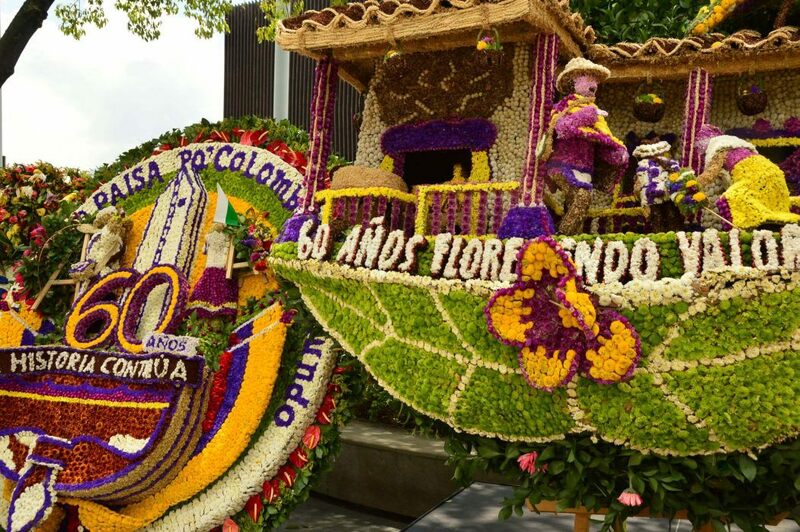 Colombia and Medellin’s passion for all things floral comes to a head for one magic week in August each year known as Feria de las Flores Medellin. 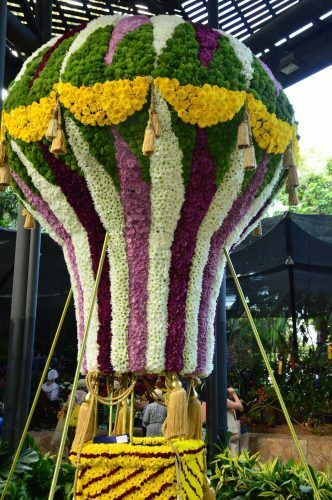 The key way the flowers are displayed during the week are on Silleteros. These wooden contraptions used to be strapped to the backs of the workers. They often had to carry their masters up steep hills. 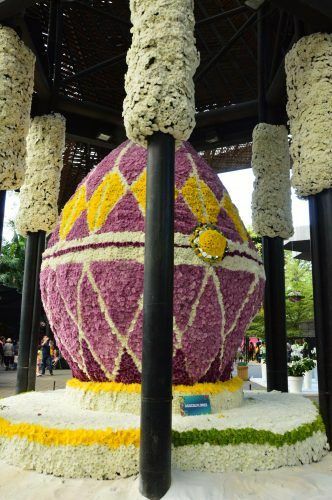 They are now used to make jaw dropping floral displays that are judged in the competition that is the peak of the festival…. More of that to come! 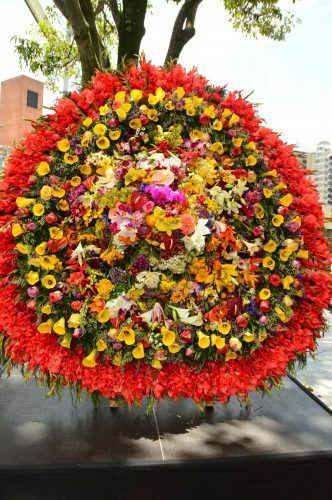 The Medellin flower festival takes place over a week and literally takes over Medellin. 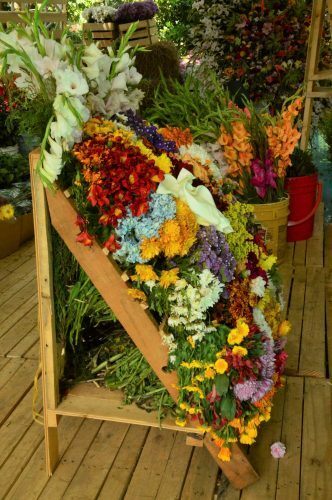 Amazing displays appear everywhere as do major street vendors. 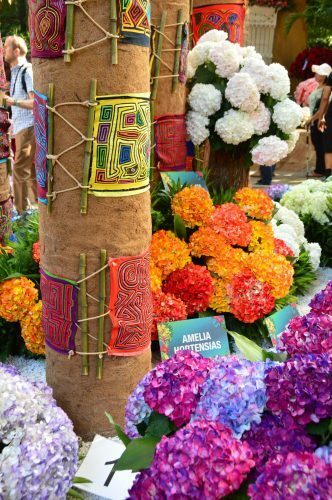 Even the stairs of the metro stations are decorated with the Feria de las Flores Medellin! There are multiple events every day leading up to the ultimate event – the major parade known as Desfile de Silleteros. 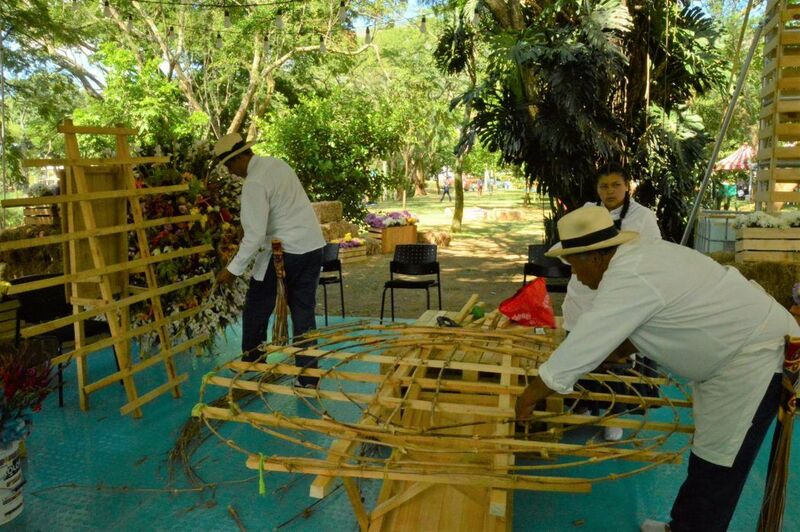 https://www.viajesdestinoantioquia.com/ – alas this one is in Spanish only. 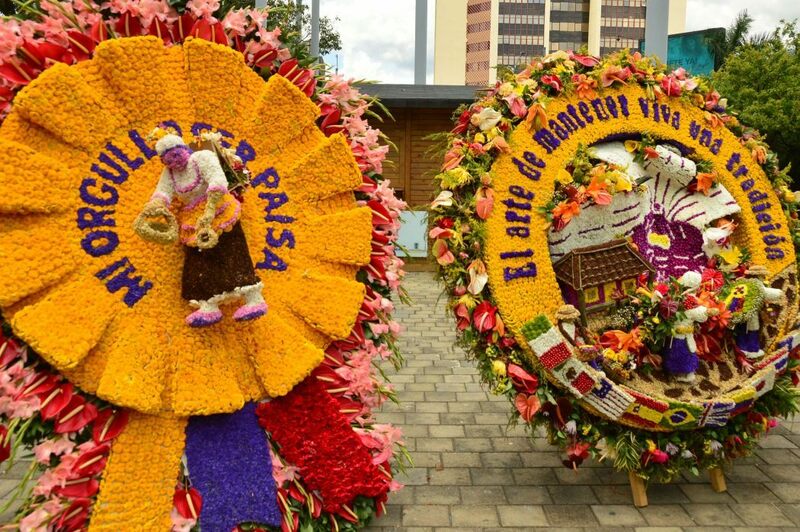 I attended the Feria de las Flores in 2017 and these are the events that I attended. I assume they will hold events in these same locations each year. This park is conveniently located near the Medellin Botanical Gardens (see below) so I thought I would combine both into one visit. I was a little disappointed. I may have gone too early in the week – however, it was all happening at the Botanical Gardens so maybe not. It is a big area to cover and I did a full circle. There were lots of stands selling food and drinks but not a lot of impressive flower displays which is what I was after. 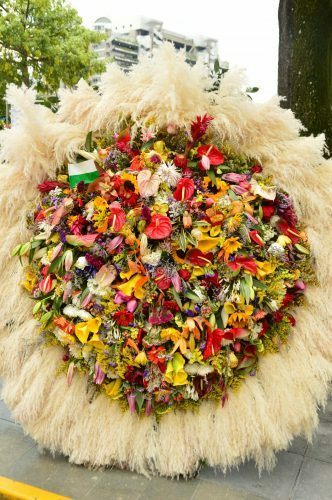 I did see some locals preparing their Silleteros which was great and there were a few of the fully assembled round floral displays. If you are travelling with kids then this could be a good thing to do as it is more interactive and food based. However, if you are after amazing floral displays this wasn’t the place. Restaurants in Medellin: The 10 Restaurants & Cafes Not to Miss! This was the highlight of the festival for me! 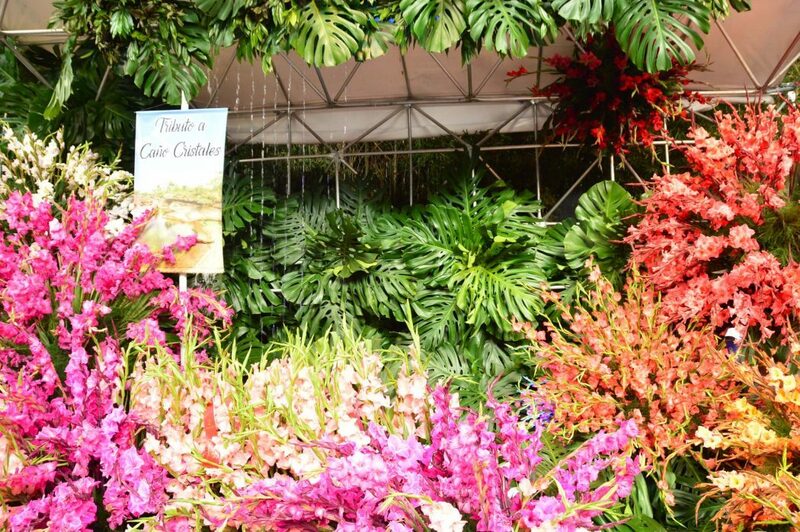 The Medellin Botanical Gardens are huge so make sure you go in the correct entrance (you need to pay about COP18000 for entry – so if you have to pay you know you are in the right place!). Upon initial entry, it is quite overwhelming how much is on display and the number of people! The first area you will enter is basically people selling loads and loads of plants and flowers of all descriptions. Move forward through this area and then take a left as you are looking to get to the centre of the gardens – the Orquideorama. 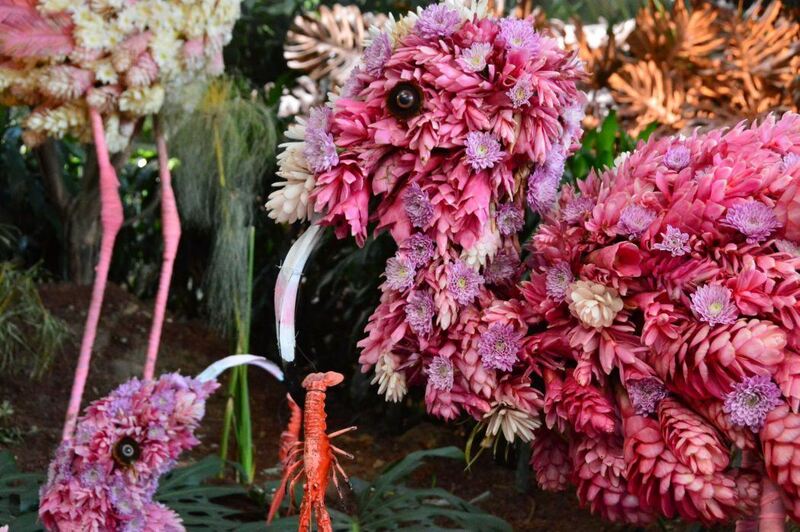 This is where the most amazing floral displays are on show – move over Chelsea Flower Show! 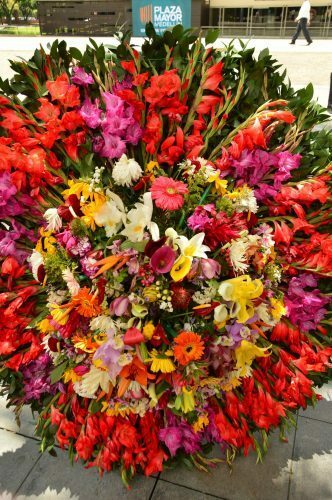 This large area houses many essentially flower installations – the reproduction of different themes and scenes created from flowers. There were some stunning displays. Everything from village scenes to hot air balloons to animals to more arty displays to giant butterflies. Don’t forget your camera and I would also recommend taking video footage! Allow at least one hour to explore this area. 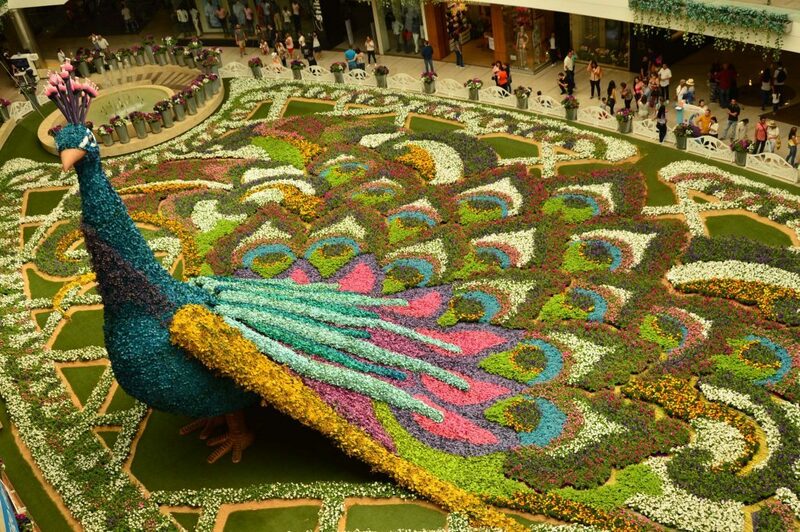 The Flower Carpet was a unique display put on at the popular Santa Fe shopping centre. 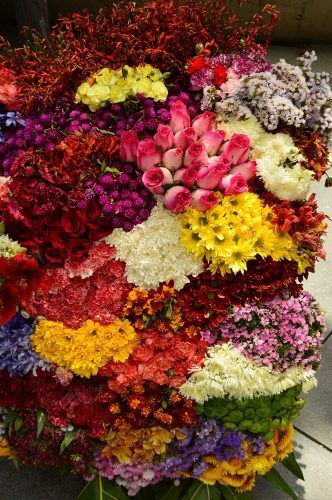 The ground floor of the shopping centre was taken over by an enormous mosaic flower carpet – well I think they were flowers. They looked like flowers but they had a slightly odd texture. 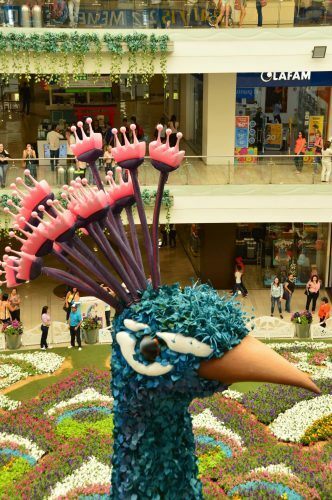 Anyway rising out of the carpet was a 3 story high peacock, again created from flowers. The peacock is stunning and it is definitely worth checking it out from a couple of different levels and angles. 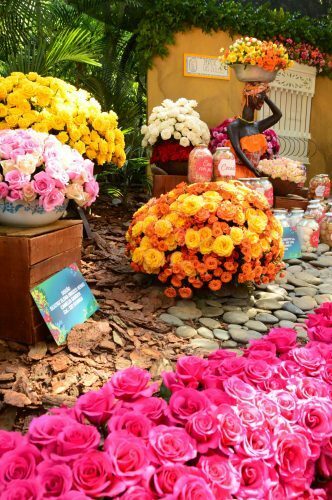 One of the most instagrammable elements of Feria de las Flores. The Desfile de Silleteros is the culmination of the festival. Traffic is shut down on the main street that runs along the spine of Medellin. Hundreds of Silleteros make their way on a long walk with a heavy weight on their backs in between floats, musicians etc etc. Like a giant parade in any big city with roads closed chaos generally reigns. You can buy some pre-booked seats but you of course only then get to see one spot in the parade. It can be very difficult to get visibility in the sea of people. I chose to watch the parade on tv instead! A bit rubbish I know but I couldn’t face the massive crowds and I had surmised that it would be difficult to get any decent photos so what was the point! And I also knew about number 5 below! Whilst in Medellin why not check out a Pablo Escobar Tour? For the 3 days after the parade, the winners of the various prize categories from the parade are assembled in Plaza Mayor so that everyone can get a good up-close look. I highly recommend going along to this. There were a few people there but I got some great shots of the winning displays and the prize silleteros! They also have the winners of the commercial awards there as well eg businesses who generated floral displays using their brands. There is no cost to see the winners and I believe they are generally in the plaza for a few days. The balance of entrants is on display at the South Bus Terminal Station on Carrera 65.. 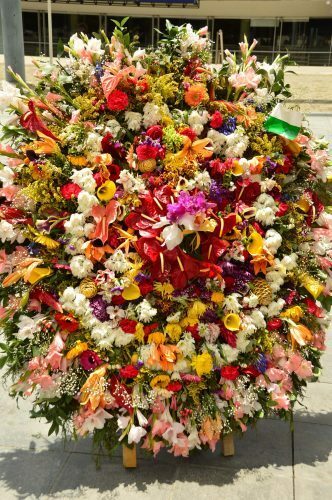 I didn’t go and see these as I was a bit flower festival exhausted by this point but based on Plaza Mayor it would definitely be worth a look. 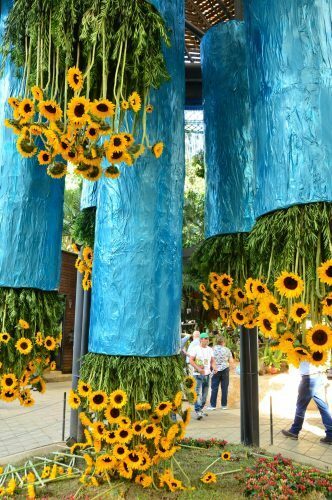 I really enjoyed being in the city during the Feria de las Flores Medellin and the Botanical Garden displays were the highlight for me. The city did feel busy but not insanely busy and it felt very special to be in Medellin during its peak event. It was also a really lovely different thing to do – and highly photogenic! 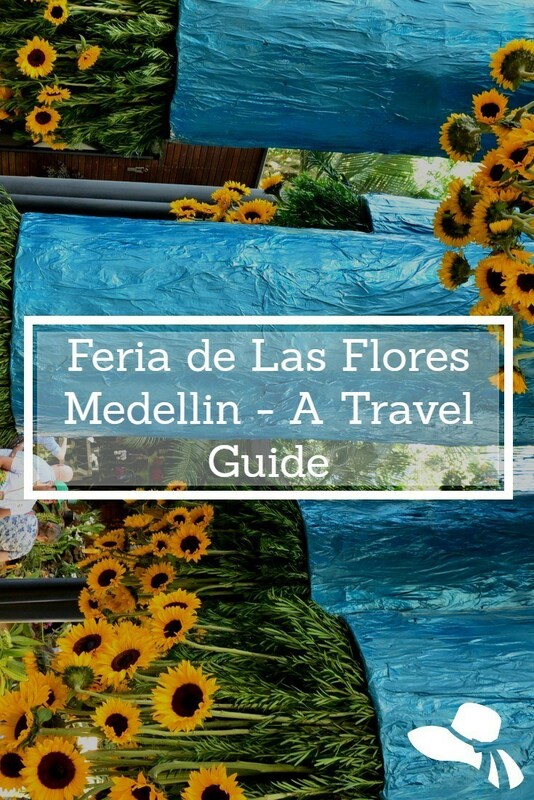 I would absolutely recommend making the effort to visit Medellin during the Feria de las Flores. Medellin has an international airport – however, there are not a load of international flights in and out! Iberia flies direct from Madrid (see my review of Iberia Business Class) but generally, you will go via Bogota. There are however loads of domestic flights in and out of Medellin. As Colombia is large and hilly flying internally is common and very reasonably priced. I used the national carrier Avianca several times and found them very safe, good service and quality and very reasonably priced. The airport is about 45 minutes by car from El Poblado – the main tourist area in Medellin. It is a long and windy trip down a mostly single lane road. They are currently building a tunnel from the airport into Medellin but that is still under construction. A private taxi will cost you about 70,000COP. It is not recommended to use one of the taxi apps to and from the airport as they have been stopped and not allowed to continue. A shared taxi can be taken from the Taxi Colectivo Aeropuerto near San Diego Mall. It will cost you less than 20,000 COP but will not leave until it is full (4 passengers). There is an airport bus which goes from a stop on Palmas near San Diego Mall and this costs about 10,000COP. Don’t leave home without travel insurance Click here for a good deal . Pingback: Restaurants in Medellin: The 10 Restaurants & Cafes Not to Miss!